This is a very roomy home in a distinguished area with a low HOA cost annually that will include a clubhouse, pool, tennis court, basketball, wooded trails and creeks. About 3000 sq ft of living space offering a formal Living Room open to Dining Room, an Eat in Kitchen with tons of cabinets and storage pantry, sunken Family Room with Stone, gas fireplace. A bedroom off the Family Rm can easily be made into an office or den. Convenient First floor Laundry Room offering tons of storage room. Vaulted foyer with a curved staircase and decorative planter area. Upstairs with 3 excellent size bedrooms and baths. Storage area off the Master Bdrm and Linen Closet in Hall. Full Basement has finished Lodge for entertaining and still has lots of area for storage. Attached 2 car garage. Covered Front Porch. Wooden Deck can be great for those outdoor BBQ's with a beautiful view of a wooded lot, paver patio, landscaping and a soothing stream running curved along the backside. 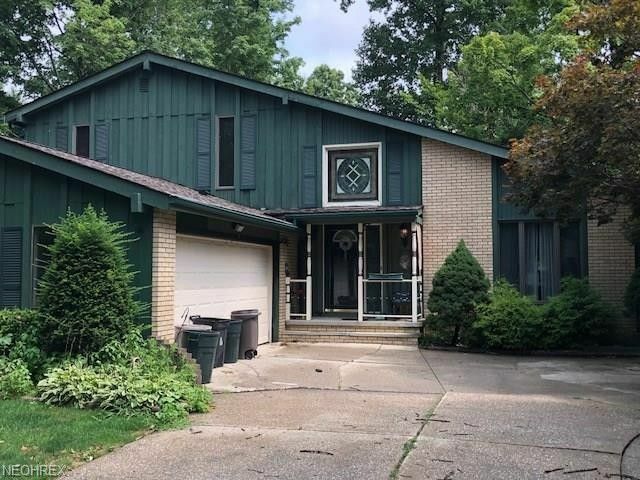 This home was built with many custom features and it will not take much to bring it back to life to showcase a beautiful home for you in a gorgeous surrounding with all those amenities! Some loving care is needed but it will be worth it at this price in Old Mill Village!